Each year, NASA spends million exploring outer space in an effort to make the unknown, known. Just as we’d like to know about life on other planets, many of us would like to know about life on the other side. Eighteenth-century philosopher Emanuel Swedenborg was—in many ways—a human rover of the spiritual world. Lucky for us, he was also meticulous in documenting what he found during his afterlife expeditions. In this episode of Swedenborg and Life, host Curtis Childs reviews some of Swedenborg’s written accounts about the kinds of angels he encountered in the world of spirits to help us understand what kind of intelligent angelic life is out there! Does the spiritual world have a hierarchy or order? 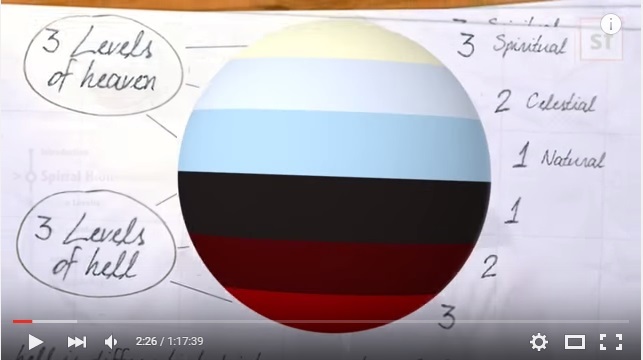 According to Swedenborg it does, and it functions like a globe. He says there are three levels of heaven and three levels of hell, and they’re purposely designed with a careful balance so that the highest level of heaven corresponds with and balances the lowest level of hell and so forth. This equilibrium in the spiritual world is essential to human consciousness and the balance of good and evil in the physical world. Many question why God allows evil when he has the power to simply banish it. Swedenborg answers that question in his book Heaven and Hell, which Curtis discusses in this segment on the need for equilibrium between the two spiritual worlds. Extra credit! Curtis challenges viewers to think about how the levels of heaven apply to the levels of the mind throughout the rest of the show. Since many spiritual leaders, including Jesus Christ, have said that heaven is within us—think about how you’re a microcosm of heaven. Curtis starts off this segment with a definition of terms to help guide the rest of the complex conversation, and the definitions come from Swedenborg himself. Curtis takes a moment to further define that in Swedenborg’s view, all angels used to be people. He then moves on to define the three levels of heaven as described by Swedenborg. Swedenborg also calls the angels in the three levels 1) heavenly, 2) spiritual, and 3) natural. Start watching at minute 15:00 for a more detailed clip on the levels of heaven. 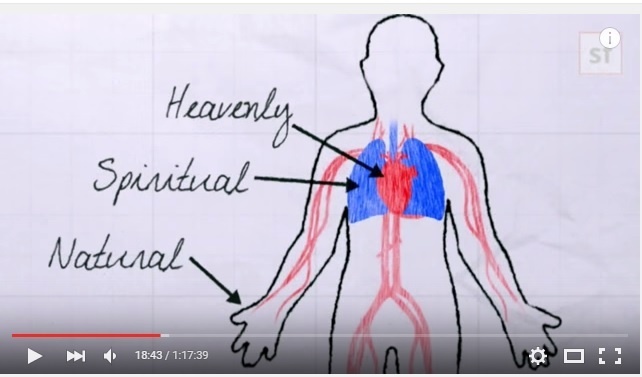 Swedenborg divides the two main kingdoms of heaven by “heavenly” and “spiritual.” The third level or “natural” level is an outer form of both of those kingdoms. So what are the heavenly and spiritual heavens like according to Swedenborg? In other words, what the heart does for the human body, angels do for heaven. Watch starting at minute 25:30 for an animated look at the spiritual and heavenly mindsets of angels and what sets them apart. Connectors between the levels of heaven can be thought of visually like the human body as touched on in the previous section. So how do the heart and lungs work together like the different types of angels in heaven work together? To help explain, professor of biology and chemistry Dr. Edward Higgins joins the conversation to explain how the heart and lungs work together for good of the whole body. Think about how the heart pumps blood and oxygen to the lungs and out through the body. Similarly, angels pump love and wisdom out through heaven and into us for the good of the whole world. 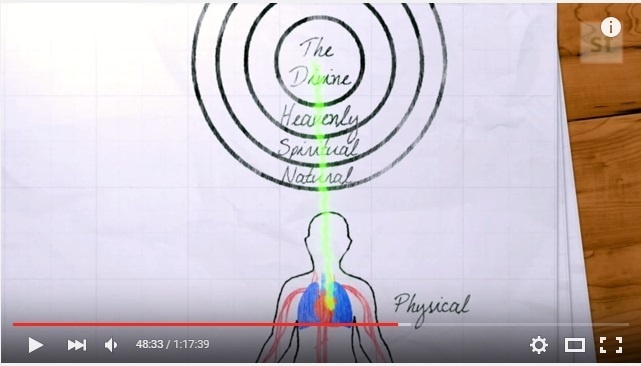 Watch the rest of the video segment about parallels that connect the spiritual world to the physical world! Angels help newcomers when they cross over into the afterlife. Angels guide visitors like Swedenborg through their communities. At minute 50:60, Curtis introduces an animated excerpt from Swedenborg’s True Christianity that describes two angels from different levels of heaven communicating with each other. 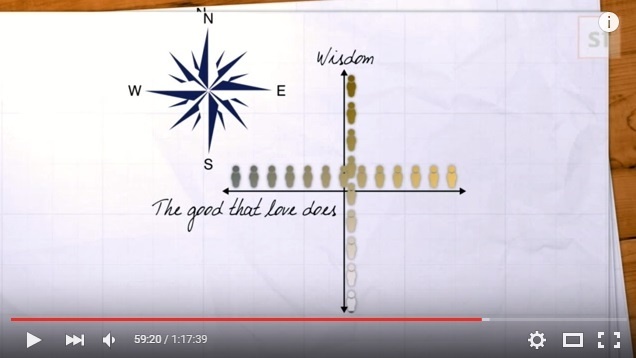 When Swedenborg talks about direction in heaven, it’s not the same as north, south, east, and west on earth. He describes the directions of heaven as four quarters guided by wisdom and good. Curtis reviews an excerpt from Swedenborg’s Heaven and Hell about the directions of heaven and then an excerpt from Secrets of Heaven about the constantly evolving nature of it. Do you see heaven and its angels working inside of you? Jesus said the Kingdom of Heaven is within us? Where does Swedenborg say it is? Will there ever be a war between angels and demons on earth? If things are balanced, does that mean that there are as many people in hell as in heaven? I thought that God did not want anyone to perish. Is it true that hellish spirits can’t come and live in the heavenly or spiritual realms? I don’t want to get to heaven and Charlie Manson is my neighbor. Why do preachers say if you don’t except Jesus you will go to hell. Is that true? Does Swedenborg agree with Edgar Cayce about the chakras being the seals of revelation? So who gives the angels of these different kingdoms their jobs? Also do angels know straight away how to communicate with other angels? Or do they have to learn? What does Swedenborg mean that the last judgment happened in 1757? In the earthly realm we live, grow, change and graduate to different levels in our lives. In heaven, are we capable of growing? And when we are reincarnated is that to grow in heaven also?